Ervik Surfshop offers equipment for all fun water activities. Eco-friendly soft top surfboards, wetsuits from 2 years to XL, boots, gloves and hooded vests, snorkel kits and Stand up paddle boards. Rentals are available from 1 April to 15 November when THE SHOP is open. 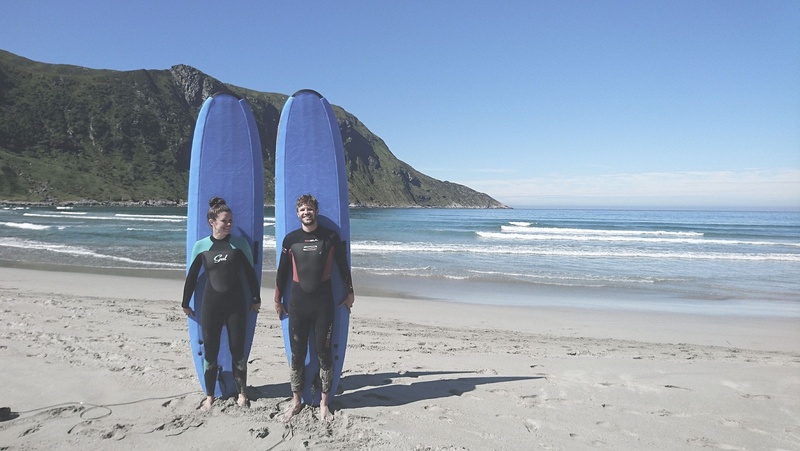 Full surf kit or SUP kit – everything you need: 490 NOK. Board 7ft, 8ft or 9ft (Eco-friendly soft top surfboards): 250 NOK. Wetsuit: 250 NOK (Kids wetsuit 2-5 years: 150 NOK). Gloves and shoes: 50 NOK / pair. Body Board or Snorkel gear (swim feet, snorkel and goggles): 150 NOK. Stand up paddle board incl. paddle: 300 NOK. Full surf kit – everything you need: 590 NOK. Board 7ft, 8ft or 9ft (Eco-friendly soft top surfboards): 299 NOK. Wetsuit: 299 NOK (Kids wetsuit 2-5 years: 199 NOK). Gloves and shoes: 75 NOK / pair. Body Board or Snorkel gear (swim feet, snorkel and goggles): 199 NOK. NB: It´s a 5 min drive to Ervik (20 min to Hoddevik). You need to be able to take the rented boards in the car to get to the surf! We always support the local community, and give a 25% discount on all rental items to everyone with zip code 6750 Stadlandet.